Throughout the years of my professional career my reeds have evolved into a personal, rather unique form. In developing this special style of reed I have been guided, as any bassoonist must be, by my own playing experiences. The type of music, size, and quality of the group, acoustics of the concert hall, the innate quality of a particular bassoon, and one’s concept of tone all influence the design of the reed. As far as type of music and performance medium are concerned, naturally if one is performing with a concert band, which normally has stronger (louder) dynamics than, for example, a Mozart chamber orchestra, the reed must have a stronger tonal projection in order to penetrate through the heavy lower brass sounds that dominate a band. In a chamber orchestra on the other hand, the absence of trombones and tubas calls for a less powerful, less strident, though always resonant, bassoon sound. The acoustics of the performance hall are another factor of much importance in choosing a reed style. A fine, sensitive hall, such as New York’s Carnegie Hall or Philadelphia’s Academy of Music, will encourage the production of pure, lovely, mellow tones, and a sound that is too bright or edgy will protrude unpleasantly. However, there are other places where a mellow bassoon tone is completely swallowed up by the excessive resonance of the hall. There are also halls so large that a bassoon sound must be somewhat edgy in order to project. In Madison Square Garden or certain convention-type halls bassoonists might long for reeds with blades of metal in order to be heard. One has to decide what type of reed will enhance the sound of his/her bassoon. There are instruments that have an inborn dark, stuffy, choked quality and others that are bright, resonant, edgy. There are flat bassoons and sharp ones, good bocals and inferior ones. Between these extremes lie thousands of various instruments, each one with its own strengths and weaknesses. I play on a 7,000 series Heckel with that happy combination of great resonance (without a shrill edge) and dark mellowness. A bassoonist’s own personal concept of what the bassoon should sound like is perhaps the most important influence on his choice of reeds. This concept evolves through years of playing and listening and is affected by one’s teachers, the type of tone produced by one’s colleagues, and, quite significantly, the bassoon concept of the conductors with whom one works. There are conductors who want the bassoon to be a companion to the trombones, and there are conductors, such as Eugene Ormandy, who want the bassoon to blend with the cellos. Let me dwell for a moment on the “Philadelphia sound.” In a sensitive hall like the Academy of Music, where every tone is heard and the attacks must be precise, it is essential that the reed be responsive in the quietest dynamics. Maestro Ormandy constantly demands pianissimo attacks in his performances. In the opening of La Mer or La Valse or, for that matter, during any work where there are soft dynamics, he insists that the pianissimos be attacked without accents and together. This is a definite factor to contend with in finishing reeds. John de Lancie, the first oboist with the Philadelphia Orchestra during the last twenty years I have been performing with this group, is a fine musician who does not believe in a blatant oboe sound. His refinement of attack and tone coincides with my own idea of the bassoon tone. My musical background was probably ideal for the Philadelphia Orchestra since it was mostly chamber music, and the Philadelphia Orchestra is a huge chamber music group. We do a great deal of listening to each other, constantly working toward fine tuning and clean attacks. My reed design, therefore, is essentially the same as it was during 1946-57, when I played countless New York Woodwind Quintet concerts and chamber orchestra concerts. I have always preferred playing the bassoon with a quintet in a cello-like manner, and I feel the woodwind quintet should seek lots of piano dynamics. During those eleven years of quintet concerts we tried to convey to the listener the smoothness of a string quartet and not sound, as do so many quintets, like a miniature band. This means smooth, mellow, resonant (but not strident) reeds. Before discussing the actual scrape I use, I should perhaps mention the obvious first problem facing the bassoonist with knife in hand: cane. 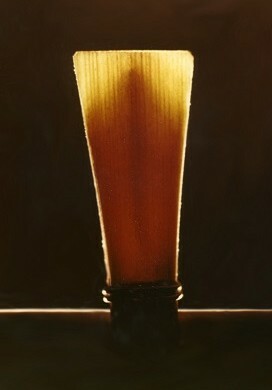 Due to cane differences a bassoon reed usually favors either the soft dynamics or the loud dynamics. Seldom is there a piece of cane that will produce a beautiful pianissimo, as in the opening of the Tchaikovsky Sixth, and have the fortes to handle a band version of Moussorgsky’s Pictures. Some reeds are better solo reeds than others, and the best of these I set aside for concertos. If the demands of a concert are particularly heavy sometimes a change of reed during the concert is required. For example, I might want a very soft, dolce quality in a lyrical slow movement and a more aggressive and somewhat heavier reed for the remainder of the concert. While most of my reeds are generally the same style and dimensions, I do vary the scrape to some extent depending on the properties of the cane and the tonal qualities desired. After shaping and profiling the cane, making the blank, and wrapping with thread, I soak the wrapping in melted beeswax (a neat solution to the problems of loose winding and minor leaks in the tube) and clip the blade to a length of 1-1/8″, which includes a bit of bark collar, as the top wire usually settles a bit behind the end of the bark. I then scrape the areas shaded in Diagram A, always tapering evenly toward the edges of the reed. Then I continue with the areas shaded in Diagram B. the channels. Next, the tip area is blended and the usual fingernail silhouette formed. With pliers I adjust the tip opening to about 1 mm. at the center. At this point the reed should vibrate giving a sharp pitch, and it is necessary to lower the pitch while aiming at that elusive resonant, dark, mellow tone. With more scraping in the channels the pitch will drop somewhat and the quality-should improve. For still lower vibrations and more darkness I next carefully scrape the back area near the wire (Diagram C), and I usually cut the bark off even with the top wire. I leave the rails or sides fairly thick from just behind the tip area to the wire in my design, for they contribute, along with the spine or center thickness, to the strength of the reed. The finished blade of most of my reeds is between 31/32″ and 33/32″, depending on the strength of the piece of cane I have selected and the season of the year. (In summer the bore of the bassoon swells, making the instrument sharper, thus requiring a slightly flatter reed, while in winter the dry, heated air causes the bore to shrink, making for a flatter instrument and requiring a sharper reed.) There are other considerations which influence my final blade length, such as the pitch of my colleagues at a given time, the tuning of a soloist (piano and violin are so often high), and the range of a particular solo (a Tchaikovsky Sixth opening needs a flatter reed than a tenor range solo such as Tchaikovsky’s Fourth ). Obviously, then, any set of measurements will apply to a particular reed and as such are not absolutes to be applied to all pieces of cane for all circumstances. 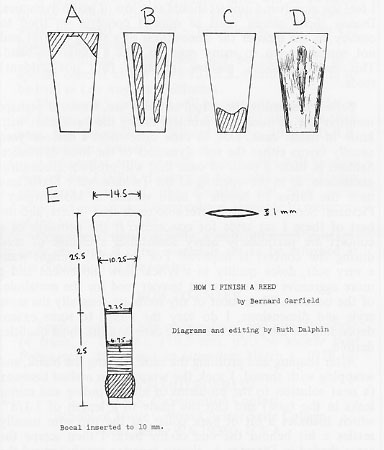 Diagram D is an attempt to show the contours of the lay as seen when the reed is held in front of a strong light, and Diagram E is a general guide showing the measurements in millimeters of a “typical” reed in my reed case. Naturally each player’s requirements and goals differ, and there are too many variables for one style of reed to be the ideal reed for everyone. My own concept of tone, Heckel bassoon, background in chamber music, regular performance in a fine concert hall with outstanding colleagues and a conductor who favors a smooth, blending type of bassoon sound have led me to the style of reed described above.